How do urban system models, smart cities and big data can help shape our urban future? 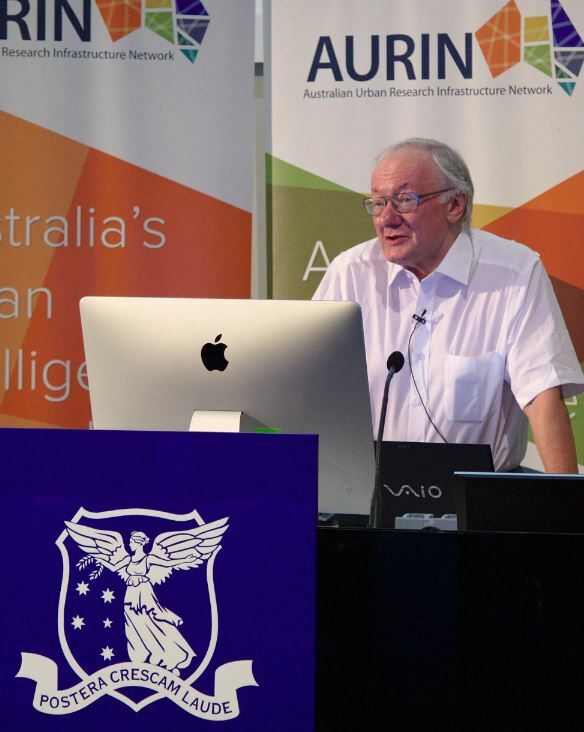 AURIN recently hosted a Lecture and Panel Discussion featuring world-renowned British urban planner and geographer Professor Mike Batty and a panel of Australian experts to discuss this question. Professor Michael Batty—winner of geography’s equivalent of a Nobel, the Vautrin Lud Prize—discussed how big data and decision science can predict and shape our changing cities. This was the key public event for Mike’s visit to Melbourne, arranged in partnership with CSIRO. Professor Batty’s lecture explores ‘the good, the bad and the ugly’ elements of this change, illustrated with a number of studies of how smart cities technologies are infusing, informing and potentially confounding planning in London. How is big data being used to improve the London Tube system? How useful was modern urban modelling in predicting the impacts of a big infrastructure project like the 2012 Olympic Games? And how might this approach help London and the Thames Gateway prepare for the climate change adaptation challenges of sea level rise? The event saw Professor Batty joined by a panel of Australian experts to discuss the local implications of this kind of data and research for cities, policies and decision making. Michael Batty is Professor of Planning at the University College London (UCL), Founding Director and now Chairman of the Center for Advanced Spatial Analysis (CASA) Lab. A world-renowned pioneer in computer modeling of urban systems, he was awarded the 2013 Lauréat Prix International de Géographie Vautrin Lud (the so-called “Nobel for geography”). He is the editor of the journal Environment and Planning B: Planning and Design, and author of numerous books – including the New Science of Cities (MIT Press, 2013), the Cities and Complexity (MIT Press, 2005), Virtual Geographic Environments (Science Press, China, 2009) and another 12 monographs and books. Among his numerous other awards, he received a CBE in the Queen’s Birthday Honours in 2004 for “services to geography”, is a Fellow of the Royal Society in 2009, and is the recipient of the 2010 Alonso Prize of the Regional Science Association and the 2015 Gold Medal (the Founder’s Medal) recipient of the Royal Geographical Society. Professor Kate Auty is a Vice-Chancellor’s Fellow at the University of Melbourne, a Member of the Australian Urban Research Infrastructure Network, and the Chair of the Advisory Board for the Melbourne Sustainable Society Institute. Prior to this, she was the Victorian Government Commissioner for Environmental Sustainability. John Holland is Manager Strategic Planning at the Dennis Family Corporation and Victorian Divisional Committee Member for the Planning Institute of Australia. He also has a background in local government planning, including over a decade as Manager Strategic Planning at Cardinia Shire Council, a municipality in Melbourne’s suburban fringe. Professor Mark Burry is an architect and academic. He is a Professor in Urban Futures at the Melbourne School of Design. Mark’s research has an emphasis on architecture and technology, including historical and cultural implications. Originally from New Zealand, Mark was previously the Professor of Innovation and Director of the Spatial Information Architecture Laboratory and founding Director of the Design Research Institute at RMIT University, Melbourne, Australia. He is also executive architect and researcher at the Temple Sagrada Família in Barcelona, Catalonia, Spain. Andrew Dingjan is Director of AURIN, appointed in March 2015. He joined from CSIRO where he held executive level technology commercialisation and research management leadership positions. As Research and Business Leader for CSIRO’s Mathematical and Information Science’s Decision Technologies group, Andrew successfully led the first commercial deployment of CSIRO’s decision sciences in customer centred ‘service processes’ for the federal government. Tanya Ha is an Associate of the Melbourne Sustainable Society Institute and also Science in Public, a science communication agency working with AURIN. She is a past board member of Sustainability Victoria and an award-winning science and environmental broadcaster and journalist. She was previously a reporter for the respected ABC show Catalyst.